If your spouse likes to borrow your car, your insurer needs to know. 1. 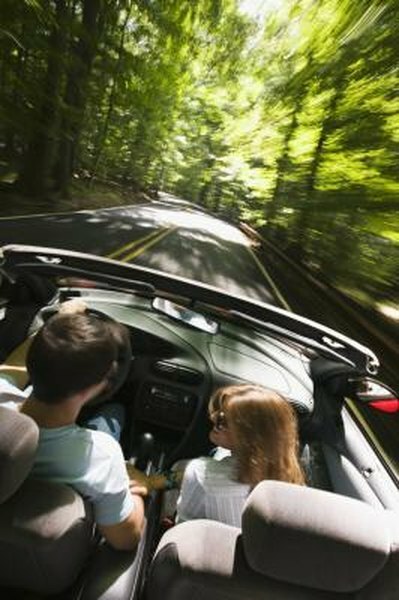 Why Is Car Insurance So High for Teens & Young Adults? 2. How Long Does an Accident Stay on Your Insurance? 3. Can You Save Money on Your Insurance If Your Vehicle Is White? You and your spouse don't have to combine insurance policies, but it's often a good idea. If your driving records are both good, insuring both cars with the same insurer often leads to a rate discount. Buying one policy for the two of you, rather than having separate policies, also might get a lower rate. But sometimes, separate policies work out better. If you're a great driver but your spouse's history is littered with accidents and parking tickets, keeping your policies separate makes sense. When you're on the same policy as a bad driver, the rate will go up to protect the company against paying out for another crash. Even with separate policies, your insurer might decide that because your spouse will probably borrow your car at some point, your rates should go up. Even when you're both good drivers, there are still situations in which one of you would have a much higher premium. If you drive a minivan and your spouse tools around in a sports car, your rates will go up to reflect her greater risk, if you buy insurance as a couple. If you enjoy discounts because you work at home and don't drive much, being on the same policy as a spouse who commutes 50 miles to work might cost you your low rate. Even if your spouse has his own car, list him on your insurance as a secondary driver. Car insurance follows the car, not the person: If he borrows the car and there's an accident, it's your insurance that covers repairs. If you haven't identified him as an occasional driver, your insurer might resist paying. This isn't an issue if he really never drives your car, but you're safer to have his name down on the policy. If you have separate policies and you want to minimize your spouse's effect on your rates, you can name her as an excluded driver. That's a commitment to your insurer that your spouse isn't going to drive your car. If she does, your policy won't cover any damages. As long as your spouse has her own car and doesn't use yours, excluding her can save you money. Some states, such as New York and Virginia, don't allow this option. Allstate: Combining Car Insurance After Marriage, Cost-Saving or Costly?